Popularity has its pitfalls, and Polly is discovering them firsthand in this middle-grade M!X novel. 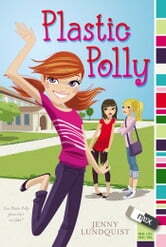 Polly Pierce likes being the second-most popular girl at Winston Academy, right after her BFF, Kelsy. Popularity comes with special privileges, like a seat at the best table in the cafeteria and a coveted spot on the planning committee for the school’s big talent show competition, Groove It Up! And since all Polly has to do is agree with whatever Kelsy says, being popular is easy—even if kids do call her “Plastic Polly” behind her back. My favorite character was Alyssa. She is confident, passionate and stubborn. I admire her taste in clothes. Her name is much like mine.